Thoroughbreds originated in England in the seventeenth century. The breed traces back to three foundation sires: the Darley Arabian, the Godolphin Arabian and the Byerly Turk. 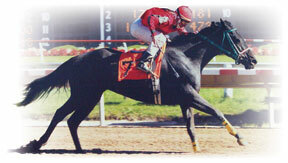 Bred to stronger native horses, the result was a horse that could carry weight across distances with sustained speed. Three hundred years of selective breeding has developed the modern Thoroughbred we know today. Most folks associate Thoroughbreds with racing. They are tremendous atheletes, also excelling in other disciplines such as hunting, dressage, jumping, cross-country and polo. The Thoroughbred has also been a strong influence in the development of other breeds.